CYCLINGFORUM.COM -- View topic - C Record ? 11/7/18 11:27 PM C Record ? 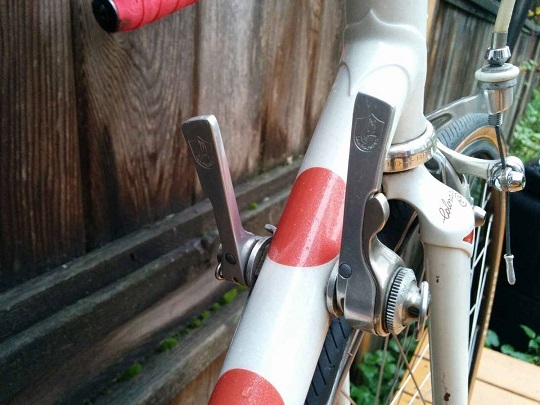 What is the deal with the down tube shifter secondary lever? Does the rear drop out have some odd small eyelets? 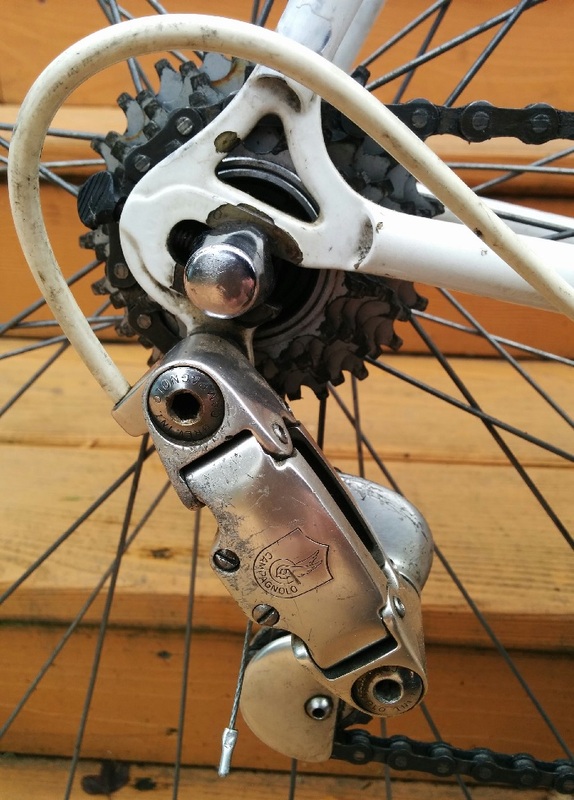 Is there a smooth round plate attached to the inside of the dropout, like something that could be a chain hanger? Does the secondary lever switch between indexed and non-indexed modes, perhaps? What you've got there is a Syncro shifting system . (INDEX) mode to friction mode." The bike is pretty cool actually, A Polka Dot Serotta for sale I saw on CL. I have C Record, but not that particular mutation. Can't go wrong with a Serotta (I have 4). Those levers must have really sucked because they replaced them with Synchro 2 which had toothed washer inserts that would break and were a total PITA to replace. 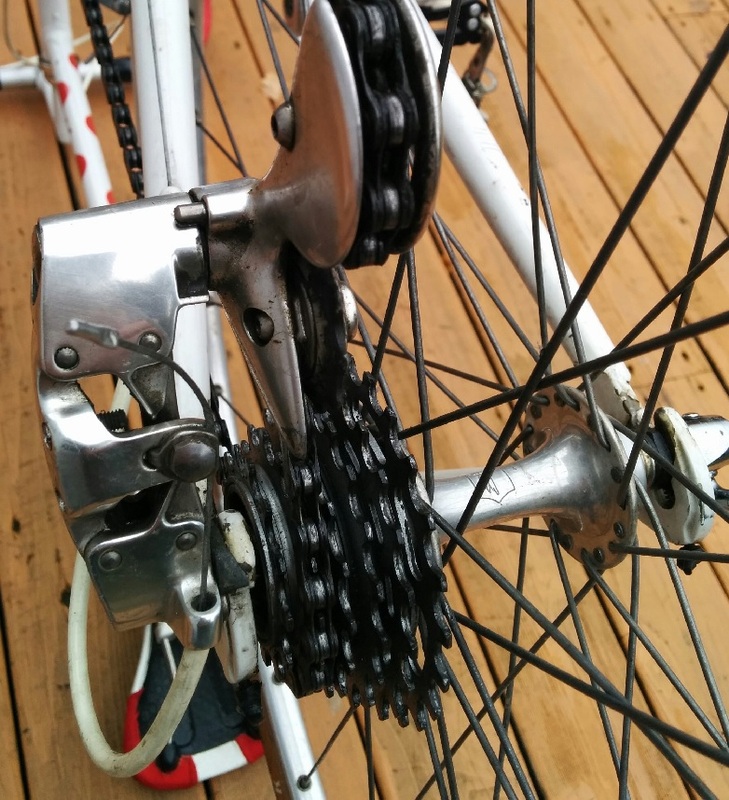 Count me as one who actually liked the 7s permutation of SynchroII, though with the benefit of newer freewheel and chain and with the shifter guts kept lubricated. The listed bike has the valuable 1st-gen C-Record rear derailer, but the brakes and cranks appear to be Athena and Chorus, respectively. That rear derailer is worth real money if the mounting tab piece isn't broken, the telltale indication of which is that the seller removes a washer and bolts the derailer on solid (no pivoting) at the mounting bolt. 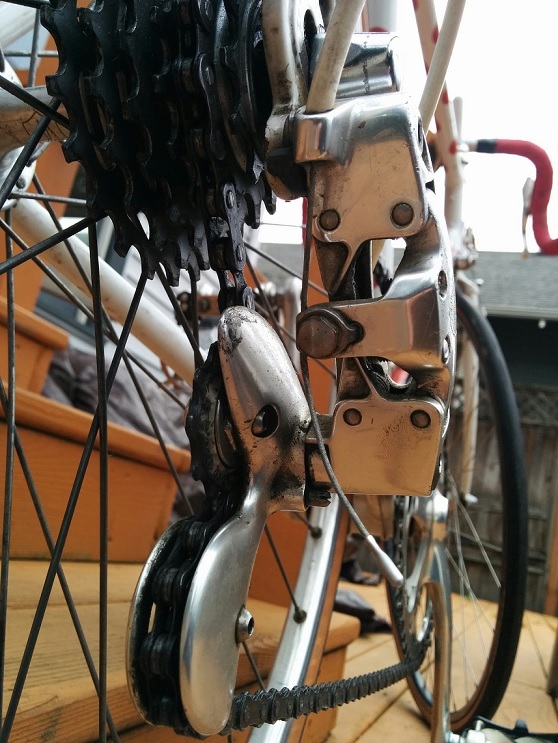 "rear derailer is worth real money"
On the Serotta Polka Dot bike? In this pic, is the cast stop gen-1 and the steel add on gen-2 or something? Guy sent me some under and back R_DR shots. Does not look like the pics in the previous message. Has it been add hock repaired? Or is it gen 3 or something? Not so sure this condition RD is going to be worth the $200+ range or even close. And this auction, the DR was far from mint too. 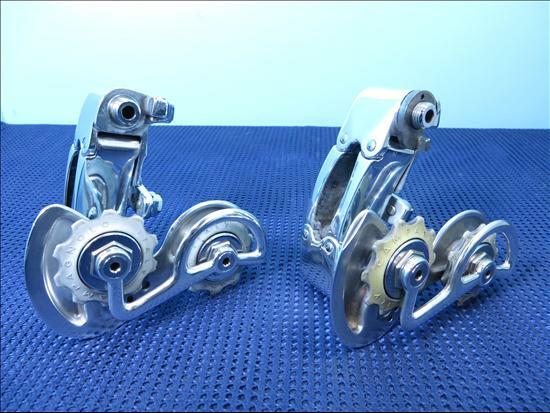 Thanks for doing my homework, parts like these can be a good way to get the rest of a bike cheaply, snce a lot of good vintage bikes end up selling for just $300-500. I've bought a few great vintage bikes that were nearly free after I sold off an included pair of Delta calipers or even Cobaltos. So it's worth knowing what top parts on the used market are going for when searching for vintage bike buys.